Among the macho style of beers--doppelbocks, stong ales, barleywines--perhaps the greatest (mucho macho?) is the imperial stout. This is partly due to its strength and profile (huge, oily, black), but also its history: as early as the late 1700s, British brewers were shipping it throughout the Baltic region and as far as Tsarist Russia, from whence came the name, Russian Imperial Stout. Original gravities range from 1.075 and go up past 11, with alcohol from 9% and up. When you brew an imperial stout, you throw about everything you can think of in it, including more hops than even extreme hopheads think is a good idea--to balance the malt, you need electric amounts of alpha acids. For me, the most characteristic quality in a good imperial is the narcotic effect it gives, a warmth that radiates right into the hypothalmus. It induces a sense of wellbeing and an insensitivity to chill winds. Based on my informal glances in pubs across Portland, Beervanians drink a lot of stout, and this is supported by my (highly scientific) sample of friends and acquantances--a few of whom only drink dark ales. So I was both interested and not particularly hopeful when I picked up a bottle of Victory Brewing's Storm King. Fantastic name, but what could a Pennsylvania brewery hope to offer a dark-hearted Webfoot? The information about Storm King is scant (malt: "2-row barley," hops: "American"), but there seems to be something special in the beer. It pours out like motor oil and from its viscous surface rises the aroma of peat. It's a smoky, earthy smell, and I wondered if the brewery somehow managed to peat-smoke some malt. I was shocked to discover that the lovely aroma actually understated the complexity of Storm King. It's the kind of beer you could swirl around in your mouth for five minutes just to suss out the different elements. Its central characteristic is a deep bitterness, at times like coffee or very dark chocolate, but other times like a nice scotch. That's the impression I finally took away from this beer, too--it had the kind of satisfying intensity of a peaty Islay malt. It was one of the most extraordinary beers I've had recently. I have generally considered Rasputin to be the standard of imperial stouts, but I'm afraid we have a new contender. I'd love to see an Oregon brewer consider this Pennsylvania gauntlet and see if it can be matched. Malts: Two-row pale and ... ? I continue to work my way through the winter beers, but there is such a bounty that I have my work cut out for me. (Not like it's ditch-digging or anything.) Two of my recent samples hail from Oregon and are a mixed bag. Since Full Sail already had one winter seasonal, John Harris's cult favorite is called a "brewmaster's reserve." But make no mistake, with a name like "Wreck the Halls," you know it's a holiday beer. After Sierra Nevada's Celebration, Wreck the Halls may inspire the most fervent devotion of any winter ale, but of the two, it seems more worthy to me. Pours out a warm bronze with a pretty white head, and bursts with aroma. Bursts, as in an orange, sending its citrus into the air like a freshly-peeled fruit. Almost every winter ale will be better six months or a year after it was bottled, but this is the exception--you want to get a bottle while those hops are still so energetic. There are two central varieties of winter ale, and Wreck the Halls comes from the minority variety, a lighter, IPA-ish ale that is headed down the road toward barleywine. At 6.5%, Wreck isn't that strong, but it manages to produce the kind of thick, candied quality you like from this style. Perhaps because of the citrus nose, it reminded me of a traditional winter desert from a norther country--with dried fruit and the suggestion of liquor. I don't get the love of Celebration, but Wreck the Halls could inspire devotion. This was not a great beer. It was flat pouring out, an indistinct brown with not much in the way of a head, and had a slightly sour, cidery aroma. The flavor wasn't awful, it just wasn't anything. Very little in the way of hopping, but the malt didn't come forward, either--it lacked mouthfeel or texture or any of the kind of qualities you'd like from a malty beer (nutty flavor, creaminess). I've brewed a few batches of homebrew that have this indifferent quality, and I didn't regard them highly. For the past week or ten days, a fascinating discussion about beer taxes has lit up the Oregon Brew Crew's email listserv. 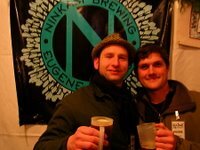 The issue at hand is the new Democratic Oregon legislature, their desire to up taxes in general and on beer and wine specifically, the waning power of the central beer lobbyist following the great Maui legislative scandal, and how all of this may affect local breweries and the price of beer. Compare beer to the other alcohols and the change is even more amazing. Borrowing calculations posted by Mark Wilson on the Oregon Brew Crew listserve, on a per-glass basis, wine is taxed at 3 times the rate of beer (2.6 cents vs. 0.8). Under the new rate, beer would be taxed 10.4 cents per glass, over four times the rate of wine. Spirits, at 8.75 cents per glass, would ironically become a relatively “cheap” drink, tax-wise. Despite my commie politics, I have always been against this tax. In a three-tiered system, producers, distributors, and retailers all make a dime off brewers back, but this tax would only target brewers--ironically the least able to absorb costs. If the legislature is serious about raising taxes on beer, they need to offer local breweries something in return. The real power brokers in the beer biz are distributors, who control which beer gets sold and where. Many restrictions have limited the power of breweries (this goes back to the old country, when English breweries dominated local markets and forced taverns to sell their beer in the "tied-house" system), but breweries now have the least control over their market. Since protecting local breweries ought to be paramount, give them more control over distribution. For breweries below a certain size, allow them to self-distribute to taverns and grocers. And put the bar a little higher--say 400,000 barrels--so none of our local breweries get hit by this tax anytime soon. Anyway, go read Gary's whole post. Good stuff. Over at The Brew Site, Jon is currently in the midst of a multi-post series on "Fifty Beers to Drink Before You Die." I'm not totally clear on the methodology--the fifty beers I want to try before I die would not be the fifty I think you should try. 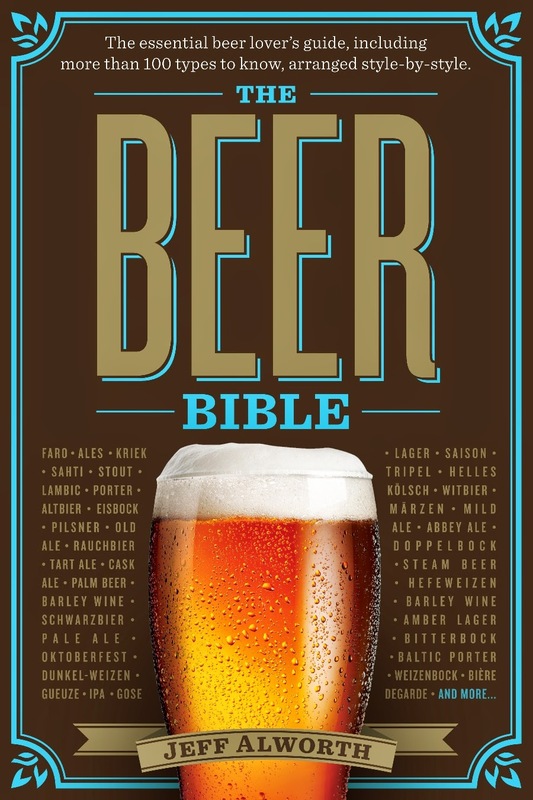 Since I've already sampled a handful of transcendent beers, I would of course urge everyone to try those; on the other hand, I suspect there are at least fifty more that might make my short list if I could track 'em down. So in a variant to Jon's enterprise, I'll offer up a game I've played with friends in the past: You're on a desert island and you can have five cases of any beer; which would they be? In beer drinking, we tend to appreciate more beers than we love. On a desert island, you only take your loved ones. Which would you take? I'll ponder and answer in the comments. 137 Year Old Beer? Tasty! But the recently-discovered cache of 1869 ale should have been undrinkable, given the conventional brewing wisdom that even the best beers are supposed to last no more than a couple of decades. Beer experts, however, say the 137-year-old brew tastes "absolutely amazing". The find includes ales brewed to commemorate royal events, including one made by the late Earl Spencer to mark the birth of Prince William in 1982. Another was brewed in 1977 for the Queen’s Silver Jubilee. The question is, if you actually acquired a bottle, would you have the guts to drink it? We'll taste about 35 winter seasonals. Includes Beer Sausage (slow simmered in winter beer) on a bun, and all you can eat chips, popcorn, and pretzels. Don't have a lot of new imports this year, so we'll taste a few stashed in the cooler from last season (should have richened up a bit!) Might even crack open a few bottles of 1993 (I think I have the most of these, have to see!) Sierra Nevada Celebration Ale! Starts at about 6 P.M. and goes until about 9 P.M.
Woodstock Wine & Deli • 4030 S.E. Woodstock Blvd. Whew, what a Fest. When I first attended this event a number of years ago (last century, I believe), it was a relatively sparsely-attended affair. The tents bustled, but there was appreciable space between bodies. This year, from the moment I arrived at 1:30 (Saturday) until I left four hours later, the lines were long, and I was in contact with other bodies the entire day. I don't mind crowds, but this seemed mainly like a problem with design. Besides the beer, there is a whole section of the space devoted to arts and crafts vendors. This may have made sense five years ago, but it's a disaster now. (In your mind's eye, envision Pioneer Courthouse Square. Now envision Waterfront Park. Now take all the festgoers from the OBF and cram them into Pio Sqaure. Now add a flea market. You see, the physics are starting to work against us.) I actually like some of the vendors--it gives you a little something to do while you're ducking from the throngs. But with the growing sophistication and popularity of big, complex beers, there's just not room for it all. One other gripe: more beer. When I arrived at 1:30, four beers were already blown (this is two and a half hours into an eleven hour fest). By midafternoon, the majority were blown. In my preview, I mentioned several international beers--all of these were either blown by the time I arrived or within minutes after I got there. No Samichlaus for me. So, recognize that this is a bigger fest than it used to be and make changes. Okay, enough on that. A close second was the fest's only stout. It seemed like a sweet stout with a heavy dose of lactose--sort of a beery equivalent of hot chocolate. It was rich and super creamy and seemed to have the essence of wholesome milk blended in. I love it when a brewery I've never tried before knocks my socks off. Klamath Falls now has two good breweries--not bad for a small town. Aggressive and alcoholic. Reminded me of the Seasonal red they do (maybe that's the "regift," but with more oomph. This is the one beer I found substandard. Somewhat funky and mildewy tasting. I think it was supposed to be a smooth toddy-style winter, ala Tannen Bomb. A good beer, but it didn't seem strong. (Looking at the brochure now, I see that it was 8.5%, and I'm shocked--it seemed half that.) I wrote "Great Scotch ale, wonderfully malty, but quite light. a 60 Shilling, not a wee heavy." Goes to show I don't know what the hell I'm talking about. Long ago there was a chain restaurant in downtown Portland with a theme--they all have themes--of beer. You could get cute little ales that tasted like soda with your mediocre food. It was so popular people packed the joint. 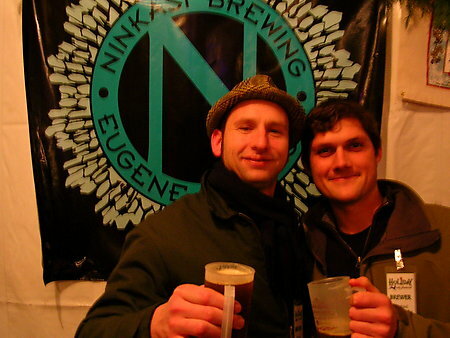 It was the one brewery in Oregon I never wrote about when I was writting for Celebrator and Willamette Week, because I refused to recognize it as a brewery. (They were pissed, but they would have been more so if I actually wrote about their beers.) Well, all that has changed. They brew real beers now, and I actually go out of my way to try them. This offering is a very tough style, and even good examples suffer by not having the complexity you'd find in a brewery with a 200-year-old yeast strain. That said, this was one of the best American examples I've had, with a complex recipe and decent yeast character. The head was remarkable, too--like whipped cream. In the Wassail/Jubel continuum of winter ales--rich, hoppy, strong, and tasty. Much has already been written about this beer, so allow me to be brief, since I wouldn't know what else to add in any case. It is a beer with great character from the nose to the aftertaste that seems to alternate among its various elements, seemingly emphasizing a sweet/sour note one moment and an old-fashioned hard candy note the next. 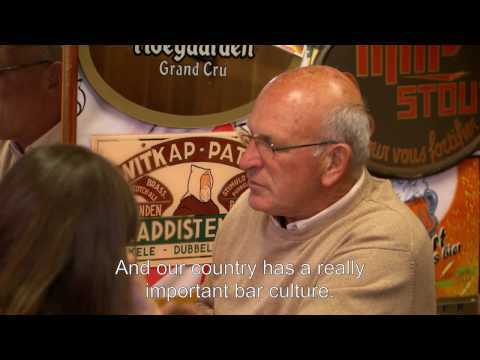 I've never seen people respond to a beer like people responded to this. I'd love to see it come on the market and observe whether it was the festival atmosphere or the beer itself. No notes on this one. I recall that it emphasized the malts and was smoother and less complex than I expected. A gentler winter warmer. I slapped together this video last night with clips from the Fest. As you'll note, I took liberties with the timing in the captions to emphasize what was happening. Cheers! I intend to put up a fuller report on the HAF later today or tomorrow, including video. However, as I'm feeling a little remiss in not getting something up sooner, here is an interim anecdote. As with many brewfests, the HAF has only a limited number of kegs. The summer OBF handles this by allotting a certain number of kegs to each day, but HAF refined this system and divided kegs up into two batches, afternoon and evening. So, moments after getting my first beer at 1:30, the Fest slapped up a sign on Hair of the Dog's Jim saying that it would be pouring again at 5. I decided to hang around until then and zip back in for a last nip before heading home, and so at about a quarter til, I (and two friends) made our way through the extremely packed crowd. So we started back into the scrum. Inelegantly, a group of tables had been placed at the center of the main tent, and these tended to gum up the movement even more. Opposite them was, somewhere in the throng, a line to the not-yet-on-tap Jim. When we finally made it to the right side of the tent, we discovered that most of the people were also waiting for Jim and ushering others through to get different beers. So as five crept slowly toward us, the crowd became more and more densely packed with Jim-waiters. Eventually the chants for "Jim, Jim, Jim" began and it looked like the crowd might rush the tap (in one slow, many-legged push). The wait endured past five and the crowd grew more spirited. By about eight after, a guy came out and, with theatrical flourish, removed the "back at 5 pm" sign. A cheer went up. We pressed closer, mug-ended arms forward. One by one, we got our elixir and began making our way back into the crowd. By 5:22, all the Jim was gone.